Having avoided podcasts for a while, I'm a little late to the game. I don't intend to ever create one myself, but I do enjoy many music podcasts. I'm looking for more, though. Any suggestions? Colin Hay, Just Won't Get Over You, from Man at Work (2003), and Garden State: Original Motion Picture Soundtrack (2004). The next time you feel compelled to analyze the political meaning of music, just consider this: how many people must hide their secret embarassment that, in the eighties, they tried to engage in discourse over After the Fire's Der Komissar? Richard Shindell, Are You Happy Now?, from Sparrow's Point (1992). I have a hunch someone will enjoy that. Once again, enjoy. This one is from the 1996 concert done at the Wang Center. Please right click and save. I'm heading back into my turkey-related stupor. A Christmas gift for you, which, I promise, the copyright holder won't mind giving. This is a recording made of my chorale's performances at the Trinity Church/Copley Plaza Christmas Concerts, in Boston. There's more to come, but please right click and save rather than left click. - Henryk Gorecki, Symphony No. 3, Opus 36, "The Symphony of Sorrowful Songs" (1993). Translated from the Polish. (Link). Having The Trout Quintet and Death and the Maiden on the same recording is a lot like a double feature of The Great Muppet Caper and Schindler's List. The Trout Quintet is one of the most cheerful, rollicking classical pieces ever recorded. Death and the Maiden, not surprisingly, is not. 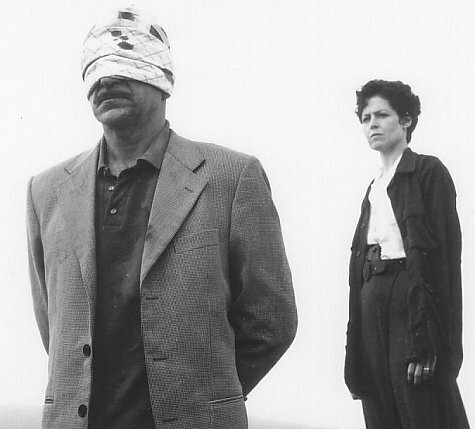 It's an intensely frantic, almost maddening, sorrowful piece (used quite well in the film of the same name, starring Sigourney Weaver and Ben Kingsley; the film was about torture and retribution in Chile after the coup). Still, the recording is top notch. The string section comes through crisply and the piano has a lot of life to it. Plus, and this is something I'm quite fond of, the CD is part of the Sony Essential Classics series, so it's generally reasonably priced (I think I paid $7.99 for this; incidentally, thanks for the birthday-related gift certificate, mom).